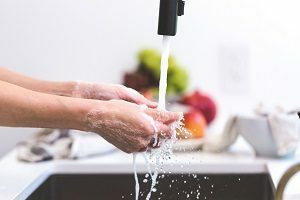 Is something wrong with your kitchen sink? Is something wrong with your kitchen sink? While it might always be piled high with dirty dishes, that’s not something a professional plumber can help you with. That said if it breaks down, or the drain runs too slowly, then you’re in luck. There is something up with your kitchen sink that a plumber can address. Let’s find out what that could be. One of the most frustrating problems with any kitchen sink is when the drain is too slow. Food debris, oils, grease, and fats are all the possible culprits behind what’s clogging your drain. To prevent these problems, don’t pour these substances down your sink drain. Although you could use a sink plunger, it might not help. That’s why you might need professional help. You might not think of water pressure as a problem that can affect your kitchen sink. But that’s where you’d be wrong. If you find that the water pressure is too low, turn off the sink and go check on the other faucets in your home. The water main for your neighborhood could have burst, cutting off the water supply to your house. It’s also likely that there is a leak somewhere you haven’t found, or the aerator in the sink is malfunctioning. Do what you can to fix the aerator, but if you discover that this isn’t helping, then you might have problems with hard water. If you hear the telltale steady dripping sound that drives you up a wall, then you have a leaky faucet. Ordinarily, this won’t be much of a problem unless your bedroom is near the kitchen. Getting enough sleep is important, but so is saving water. After all, water isn’t free. Try tightening the faucet, because it’s possible that it’s loose. If that didn’t make a difference, then you’ll need the help of a professional plumber. Then again, the problem could be caused by your garbage disposal. If that’s the case, then something is wrong with the drain line. You won’t be able to deal with this clog using plungers or drain snakes. Liquid drain cleaners won’t help, either. If this is the problem you’re having, then you’ll need to call a plumber! This entry was posted on Friday, February 1st, 2019 at 4:44 pm. Both comments and pings are currently closed.